Growing demand from insecticides, pesticides, herbicides, and other agrochemicals to suppress the growth of fungus, pest, and weed plants is driving the market growth. Surging need for higher crop yield to compensate global food demand is again fueling the market growth. Also, growing adoption of advanced farming practices in agriculture-based countries to improve crop quality and yield quantity is boosting the market growth. Moreover, raising awareness regarding hazards caused by chemical-based crop protectants is generating high demand for bio-based agricultural adjuvants. The latest report by Value Market Research expects the Global Agricultural Adjuvant Market to reach USD 4.3 billion by 2025. It was valued USD 3 billion in 2018. The report foresees a 5.25% CAGR from 2019 to 2025. On the basis of function, activator adjuvants emerged as the leading segment in 2018. 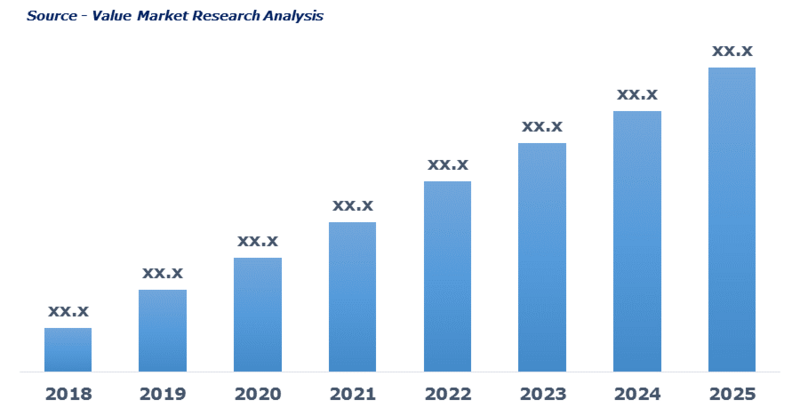 Rising adoption of activator adjuvants in postemergence herbicides to increase crop yield, boost adjuvant absorption in plant cell and reduce photodegradation of herbicides is driving the segment growth. In 2018, alkoxylates dominated the chemical segment by accounting highest market share. Rising demand of alkoxylates especially alcohol-based derivatives to treat broadleaf weeds is driving the segment demand. By formulation, In-formulation led the segment by accounting highest market share in 2018. In-formulation provides advantages such as ease in application, least chances of improper mixing and relatively cheaper is driving the segment growth. By application, herbicide dominated the segment and has accounted for maximum market share. Rising demand of herbicides to suppress the growth of weed plants by maximizing crop yield, improving crop nutrient and controlling soil erosion is driving the segment growth. The growing demand of herbicides for the cultivation of cereals & grains, fruits & vegetables, and oilseeds & pulses is again boosting its growth. Presence of major players such as DuPont, Huntsman Corporation, Helena Chemical, etc. is driving the regional market growth. Also, rising farm expenditure along with increasing adoption of precision farming has generated high demand of agricultural adjuvants in North America. Some of the prominent players of the market are BASF, Clariant, Croda International, Dowdupont, Evonik Industries AG, Helena Agri-Enterprises, Huntsman Corporation, Nufarm, Solvay, and Stepan Company. As per this study the Global Agricultural Adjuvants Market was valued USD 3 BN (by revenue) in 2018 and is anticipated to reach USD 4.3 BN by 2025 with a CAGR of 5.25%. The agricultural adjuvant can be referred to as a compound that is added to enhance the properties and performance of a pesticide formulation. Adjuvants compounds are added to insecticides, herbicides, fungicides, and other pesticide formulations this also include bactericides. Agricultural adjuvants are gaining popularity on the account of rising usage of herbicides, insecticides, and fungicides to facilitate their utility and function. Rising demand for crop protection chemicals is also expected to fuel the market growth. Also, rising awareness among farmers regarding the benefits of agrochemicals along with the advent of advanced farming equipment is further expected to fuel global market growth. Moreover, rising focus to expand the agricultural growth is further expected to drive market growth. This detailed market study is centered on the data obtained from multiple sources and is analyzed using numerous tools including porter’s five forces analysis, market attractiveness analysis and value chain analysis. These tools are employed to gain insights of the potential value of the market facilitating the business strategists with the latest growth opportunities. Additionally, these tools also provide a detailed analysis of each application/product segment in the global market of agricultural adjuvants. The broad agricultural adjuvants market has been sub-grouped into function, chemical, formulation, and application. The report studies these subsets with respect to the geographical segmentation. The strategists can gain a detailed insight and devise appropriate strategies to target specific market. This detail will lead to a focused approach leading to identification of better opportunities. Furthermore, the report comprises of the geographical segmentation which mainly focuses on current and forecast demand for agricultural adjuvants in North America, Europe, Asia Pacific, Latin America, and Middle East & Africa. The report further focuses on demand for individual application segments in all the regions. The report also covers detailed competitive landscape including company profiles of key players operating in the global market. The key players in the agricultural adjuvants market include BASF, Clariant, Croda International, Dowdupont, Evonik Industries AG, Helena Agri-Enterprises, Huntsman Corporation, Nufarm, Solvay, and Stepan Company. An in-depth view of the competitive outlook includes future capacities, key mergers & acquisitions, financial overview, partnerships, collaborations, new product launches, new product developments and other developments with information in terms of H.Q.